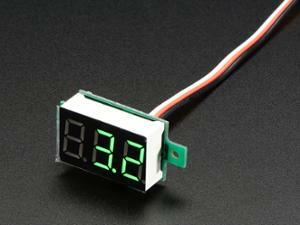 Put a voltage meter anywhere with this very handy display. These are often used by RC hobbyists for keeping track of batteries but we thought it would be great on a breadboard or enclosure. This is the 3-wire version of the volt meter, two wires are used to power it and the third wire is used for measurement. We also have a 2-wire version that measure it's own power supply. Simply connect the red wire to a positive power supply from 4.5 to 28VDC, and brown or black to the common ground to power the display. Finally, connect the orange or white wire to whatever you want to measure the voltage of. The display has a microcontroller that will read the voltage, compare it to a stable reference and display the voltage with 0.1V precision on a 3-digit 7-segment display. it can read from 0V to 99.9VDC so it will be good for any electronic project! The meter draws 3-4mA to power the microcontroller and display. This particular LED display is a nice vivid green, which we found very readable. Mounting tabs make this module easy to attach to any box or plate.